About a year ago we had a lot of debates on creature type "Beast" in R&D. We worried about the fact that all our other tribes had a nice, coherent flavor but Beast had previously been used as just a catch-all creature type for anything that didn't fit anywhere else. We talked about maybe using Centaur or maybe inventing a new race (giant insect was mentioned a couple of times) for red and green. In the end, though, we realized that those wouldn't really work because what we needed was a type that we could use not just for the biggish red and green creatures, but also for black creatures that didn't fit anywhere else and perhaps even the odd blue creature. We wanted each of our common creatures and as many uncommons as possible to fit into one of the important tribes, but we also wanted as few tribes as possible, so we decided we should invest in turning Beast into a flavorful creature type worthy of theme decks. We got together with the art guys and developed a look that would tie all the Onslaught Beasts together (look for the bonespurs -- they all have them) and things seemed to work out reasonably well. A year later we are once again embroiled in a debate about creature types. All the feedback we're getting about Onslaught is extremely positive and lots of you seem to be having fun playing with the various tribes. Creature-type based theme decks are by no means the only thing going on, but they are definitely part of what's working out well in the set and that has led us to engage in more theoretical conversations about creature types. What happens when you do a card which wants to have both a race and a class? 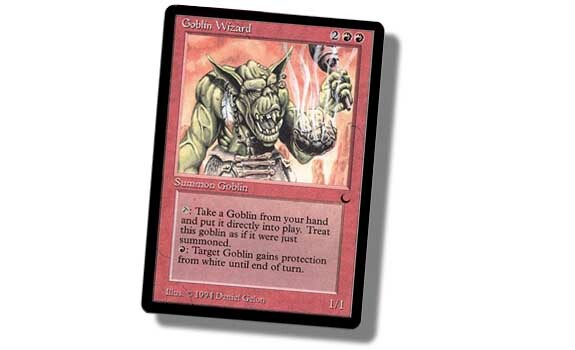 Well, I guess Goblin seemed more important than Wizard back then, and as a result Goblin Wizard can make your Goblin Piledriver bigger, but you can't sacrifice it to Voidmage Prodigy. Obviously, when a card represent a creature that uses one of our named races and has an obvious class, it should just get both creature types and in recent years that's exactly what we've done. This is the same kind of logic that led us to do the Avens as Bird Soldiers. If it looks like a bird it ought to get affected by cards that affect birds, but the Aven aren't just birds -- they're bird-people with a structured civilization -- so it wouldn't have felt right to just call them Birds. They needed a second type. A second problem that came up with the old "one type only" plan is that card names were required to tell the whole story about a card. If you wanted to have a goblin assassin you had to put the word "assassin" into the name of the card because the type was already used up by "Goblin." Well that really limits how cool and interesting the name of the card can be. If the type was "Goblin Assassin" then that part of the story behind the card would already be there and the name gets to be more interesting. Plus there's only so many ways to call a card [Goblin-word] Assassin. A third reason to have multiple creature types is that more creature types allows creatures to get played in more decks. For people who want to build theme decks, it's good to have more options. All of this is somewhat old news. R&D realized most of this years ago and began to do creatures with two types. There's a pattern to almost all of the creatures we've done with two types: one of the types is a race and the other is a class. The basic pattern is that creatures that are civilized have a job, whereas non-sentient creatures don't. 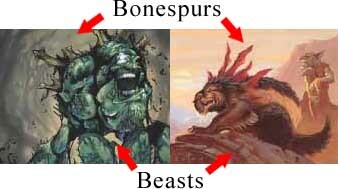 So a Beast is just a Beast, but a Goblin is actually a Goblin Soldier or a Goblin Wizard or a Goblin Something-Else. The more we talk about it, the more it seems to us that we should just switch to a full-fledged "race-class" model, for civilized races anyway. As I've been explaining, it's not even that much of a change. Dragons are still just "Dragons," but elves would always be Creature - Elf [Something]. Expect to see the gradual transition to this model finish playing itself out over the course of the next year and hopefully you'll agree that our cards get more flavorful and our creature concepts get more interesting because of the extra information that will now be on the cards. Looked at rationally, creature type "human" makes sense. If I can affect all the Birds with a card that says "choose a race" then why can't I affect all the humans? It's kind of odd that there's one special race which is treated differently by the rules of the game. There's also a certain aesthetic niceness from having a consistently applied race-class model for creature types. Inside WotC, the argument against creature type Human usually boils down to a gut-level "yuck!" No one disagrees that the many cards would be better with more flavorful types and so there is general consensus that we should include a class for any creature that has one. However, it just feels wrong to some people to include a race on the human cards -- we've been leaving it off for years and things have worked just fine. There are people firmly entrenched on both sides of this issue and the people in the middle are having trouble actually figuring out what the right answer is. In particular, there's some question of what the public reaction would be if we started printing "Human" on cards. That's where you guys come in! What do you think of the new Extended format?